According to the results, shown below, Baidu comes in third, beating out even Google (GOOGL), the world’s leading search engine, which places sixth. Intrigued by these results, I decided to look a little deeper into both stocks to see whether BIDU really is a better growth stock than GOOGL, as the screener suggests, or whether there are additional factors such as business structure and market position that give Google the edge. Valuation: Does the Price Click? 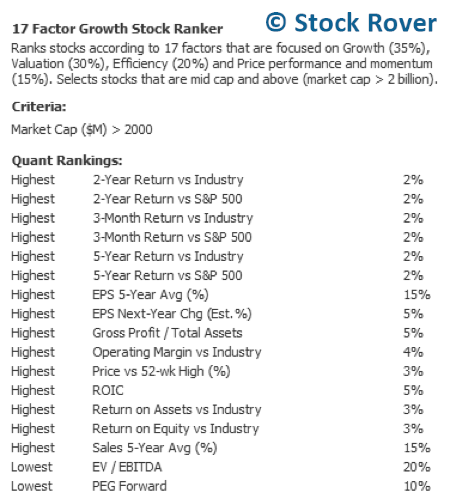 Conclusion: Who has the better algorithm for investors? Let’s start off by parsing those growth numbers, as they make up the highest-weighted category in the screener. The metrics Howard uses for the screener (above) are Sales 5-year Average annual compounded growth, EPS 5-year Average annual compounded growth, and the expected EPS Next Year earnings growth. 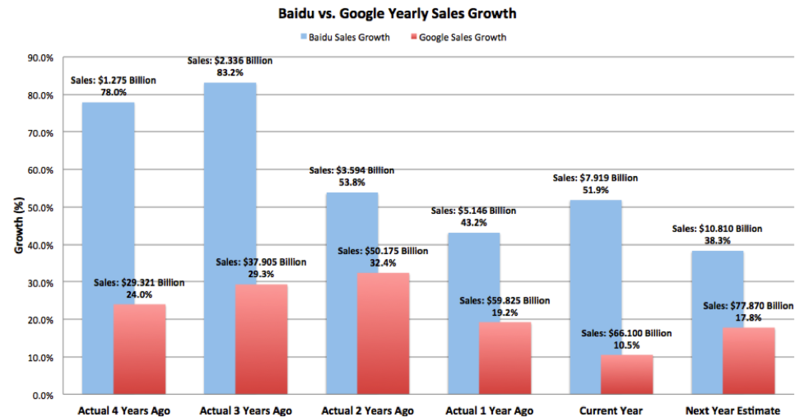 From these metrics, it is clear that Baidu’s growth is far outpacing Google’s growth, at more than double Google’s rate. However, this is largely due to Baidu’s position in China, an emerging market that is far from saturated with only 42.3% of the population listed as Internet users as of 2012. For good measure, I also looked at each company’s yearly sales and EPS growth. Google is a much larger business than Baidu, currently generating eight times Baidu’s revenue, as seen in the bar chart above. Thus its market cap is also much larger at roughly 390 billion, dwarfing Baidu’s 65 billion. That said, Baidu’s sales growth has consistently been higher than that of Google’s, as seen above. Though both companies have had strong double-digit sales growth, they have both seen dips in the 2013, with Google’s continuing into the current year. This decline is mostly driven by a revenue mix that is increasingly skewed toward mobile advertisement sales, which typically bring lower profits than desktop ads due to decreased screen size and slower connection speeds. Lower sales growth numbers over the past couple of years shouldn’t put off investors, however, since both companies are making efforts to better monetize their mobile platforms (which I discuss later on) and expect to see sales growth pick up next year. In fact, Baidu’s revenue growth of 59% year over year (YoY) for 1Q14 is a promising sign of its strong sales growth going forward. The yearly EPS growth trends (above) tell a more complicated story. 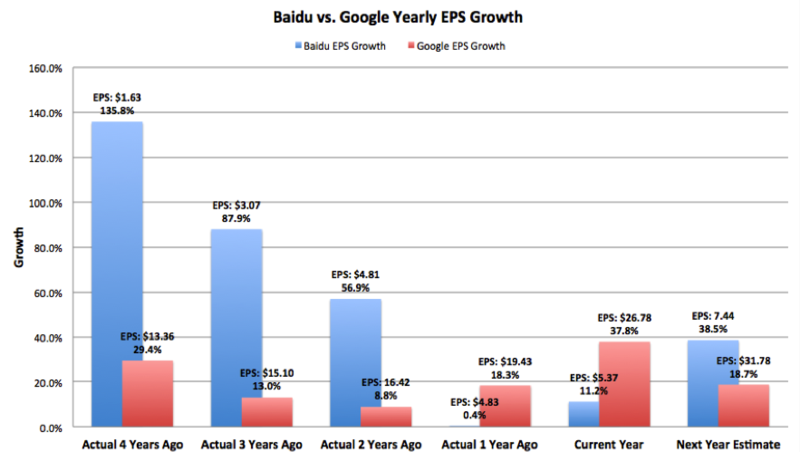 Though Baidu has seen exceptionally high EPS growth up until two years ago, it fell behind Google last year with an EPS change of only 0.4%. This is most likely due to heavy spending on investments, in particular Baidu’s purchase of 91 Wireless, China’s largest third-party mobile applications distribution platform, for 1.9 billion in August 2013, which no doubt put a dent in its earnings. Google’s EPS growth has been on average slower and less volatile than Baidu’s, but it has also had its ups and downs, hitting a low two years ago. Investors should be happy to see, however, that both companies’ next year EPS growth estimates look highly promising. Let’s check into each company’s financial statements to gain some insight as to what is going on behind their EPS numbers. Despite increasing net income, operating income, and EBITDA, Baidu’s income statement (above) shows decreasing margins, another sign of its recent spending to stay ahead of competition and maintain its position as China’s dominant search engine. Even so, Baidu’s margins are still at a very healthy range, and Morningstar analysts predict that its operating margins will stabilize by 2015 and recover to 32.9% by 2017. Google’s income statement (above) shows much the same trend – it is increasing its earnings but also its expenditures, as evidenced by decreasing net, operating, and EBITDA margins. Its gross margin has remained fairly stable over the past year. While its margins are a bit lower than BIDU’s, they are also nothing to worry about. Baidu’s balance sheet (below) looks clean as well. Though its debt is increasing, it still has significantly more cash and a healthy debt ratio of 0.5. Google’s balance sheet (below) displays a huge amount of cash and a very low debt/equity ratio of 0.1, which attests to its significant liquidity. Its debt has been climbing over the years, from $0 in 2010, which corresponds with increased spending in several areas including the mobile platform development and acquisitions. As can be seen below, each company’s cap ex, research, and intangibles metrics confirm that they have indeed put an increasingly substantial amount of money into technological investments and acquisitions relative to their cash on hand. The dramatic increase in intangibles, especially, points to the acquisitions that both Google and Baidu have been making over the past two years. Financials reveal that the two companies are acting similarly by investing in their businesses, though Google is doing so on a larger scale. And since both have healthy margins and cash to spare, this should lead to earnings growth in the future, once spending stabilizes. No clear winner has emerged yet—both are looking strong. 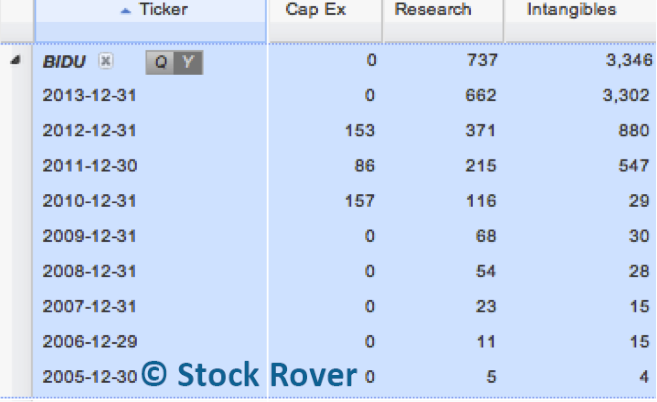 With a lower P/E and an EV/EBITDA almost half that of BIDU’s, GOOGL looks quite a bit cheaper according to the table. Although, compared to their industry, both companies are inexpensive, and their relatively low PEG forward of 1.4 suggests that their high expected growth in the coming year will justify their pricing. Given growth, financials, and valuation, it’s pretty hard to peg either GOOGL or BIDU as the winning search engine stock. Perhaps efficiency metrics, which constitute 20% of Howard’s screener, will help differentiate. The four metrics below measure whether a company is making effective use of its capital. Here as well, Baidu and Google’s efficiency metrics have moved similarly. Their ROICs have both shown a parabolic trend, increasing and then decreasing in recent years. Their ROA vs. Industry, ROE vs. Industry, and Operating Margin vs. Industry metrics have jumped around a bit but have also gone down recently. I am interpreting these efficiency metrics to mean that both companies’ heavy investments as of late have yet to pay off. Overall, both companies are doing better than the industry, with Baidu’s numbers slightly higher than that of Google’s. Finally, let’s take a look at price performance and momentum metrics, which count for 15% of Howard’s screener. The results above are quite interesting – Baidu has been performing better than Google for the past three months as well as the past five years, yet its two year returns are not only lower than Google’s but the industry’s as well. Currently, both companies are performing well, with prices near their 52-week highs. The price and momentum metrics show that BIDU’s overall growth has exceeded that of GOOGL’s, but it has lost momentum over the past two years and is only recently picking up. Thus, BIDU offers investors a higher absolute return, but only if they are willing to go along for a wilder ride, while GOOGL, as a larger and more mature business, offers a steadier path. Baidu.com is currently the most popular website in China, capturing 81.4% of the search market share in 2013, and is among the top 5 most trafficked websites worldwide. These statistics are even more impressive given that China is the country with the most internet users in the world. 79% of Baidu’s revenue comes from online search-based advertising, in which advertisers bid for priority search keywords and pay each time their link is clicked. Baidu had 451,000 active marketing customers in 2013, an amount that has decreased recently because of tightened quality guidelines. As mentioned before, the internet penetration rate in China is only 42.3%, and the government plans to invest $323 billion by 2020 to increase this number. Moreover, an increasing number of Baidu’s advertisers are small and medium sized enterprises (SMEs), though it currently serves only 1.5% of the over 50 million SMEs in China. Thus, Baidu clearly has substantial room to grow in the next few years. Though Baidu is still mainly a web-based business, it has branched out from its signature search engine to include a host of other sites such as Tieba, a forum-like platform where users can create their own “search bar”, the question-answer site Baidu Knows, an online encyclopedia called “Baike”, Baidu Maps, and game site iwan.com. Known as the Chinese Google, it is definitely taking steps to live up to its nickname. In May 2013, it acquired online video-streaming site PPStream in a $370 million deal, which is reminiscent of Google’s purchase of YouTube. It also paid $306 million for a majority stake in Qunar, a popular travel metasearch site. And in August 2013, it bought 91 Wireless in a move to develop its own app store and gain a major entry point for mobile traffic. Though 91 Wireless was quite an expensive purchase, it came with 100 million users and 12.9 billion downloads under its wing. Baidu’s team has continued to innovate upon the app store, unveiling their innovative “Light App” application that allows users to search for and run apps without installing them as a way to bring less popular apps to the surface. Given the success of Apple’s app store and Google Play, I believe that this is a smart investment that will pay off greatly in the years to come. Baidu, like many other internet-based services, is currently strengthening its mobile platform, but it faces heavy competition in this category. Though it already has 130 million users for its mobile search apps and has a good chance of holding on to its leading position due to its dominance in desktop search, it must compete against the mobile search ventures of Qihoo 360, an anti-virus software developer that developed a popular mobile phone browser, Alibaba, which has a search partnership with Microsoft’s Bing and offers pay-for-performance search on its e-commerce sites, and Tencent, which acquired popular Chinese web portal Sohu’s Sogou search engine. Nevertheless, I believe that users will still choose to use Baidu for their mobile phones, both out of habit and because Baidu, due to its wide network of users, has a superior content base. Google is the uncontested leader in the worldwide search market. It captures 87.1% of the U.S. search market and is also dominant in Canada, Latin America, Europe, and most of Asia-Pacific. It is blocked in China by the Chinese government, which is the reason for Baidu’s singular stronghold there. In terms of search competition, Google is very nearly anticompetitive, as it has become habitual for its huge network of users to use its technologically superior search engine. Google derives 90% of its revenue from search advertising. Its advertisement business, AdWords, operates similarly to that of Baidu’s, allowing advertisers to bid for priority on search results for keywords. AdWords also provides its customers tools for creating text-based ads, bidding on keywords, and setting daily spending budgets. In addition, Google’s AdSense program allows sites to provide targeted ads from AdWords advertisers, and its DoubleClick Ad Exchange creates an online marketplace for advertisements. Google’s new Enhanced Campaigns unifies its ad campaigns across mobile and desktop platforms, which has made mobile ads more valuable for advertisers. Google’s efforts seem to be working, as it decreased its traffic acquisition costs (TAC) to 23% of ad revenue and increased its paid clicks by 26% year over year for the past quarter. Google’s biggest competition for ad revenue is not from other search engines but rather social networking sites such as Facebook and Twitter, since advertisers seek the wealth of personal information that is shared through these sites. Google’s own attempt at social networking, Google+, has not quite taken off, but hopefully it will be able to attract more users in the future. The growing trend toward mobile search is currently not in Google’s favor, as mobile ads drive lower profits. However, Google already has a strong edge here—Morningstar analysts estimate that 90% of mobile searches are performed on Google—and is likely to hold on to it, especially with the growing popularity of its Android smartphone operating system, which commands 52.1% of the mobile OS market share. Mobile ads are also expected to become both more popular and more profitable in the future, especially since mobile advertising has the potential to utilize geo-locational data. Google is currently working on developing near field communication (NFC) technology for its smartphones, which would allow users to wave their phone near a point-of-sales terminal to make a purchase, in the process of forming the Android into an “all-in-one” device that can search for a store, make a purchase, and process the payment in one go. Though it started out as just a search engine, Google’s business has expanded to include operating systems and platforms (Chrome, Android), enterprise (sites and applications such as Google+, Gmail, Google Maps, and Google Drive), and hardware products (Android phones, Chromebooks, wearable smart devices). 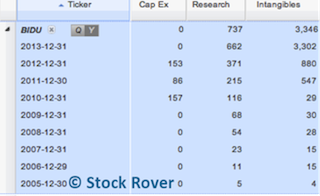 Google’s 2:1 stock split on April 3rd, which effectively halved its share price and financial data, divided the stock into publicly held Class A shares under the ticker ‘GOOGL’ and nonvoting Class C shares under the ticker ‘GOOG’, which analysts believe will be used for mergers and acquisitions. In fact, Google has made over 150 acquisitions to date, not just of other websites but of businesses across a variety of industries. Its famous acquisition of YouTube for $1.65 billion in 2006 garnered excellent returns, as YouTube is estimated to bring in a yearly revenue of around $5 billion. Google is planning to make YouTube even more profitable by adding a paid music streaming service to it and placing ads during dinnertime TV hours, though these moves may not be popular with users. Google is further venturing into the online music streaming business with its most recent purchase of Songza, which it plans to add to its Google Play Music All Access service. Its largest acquisition so far was Motorola Mobility for $12.5 billion in 2012, which it sold to Lenovo this January. Free from Motorola, which was a drag on profits, Google is now able to focus solely on software. It addition, it is giving 15,000 patents to Lenovo so Lenovo can produce Android phones, creating a competitor to Samsung, which is currently the largest Android licensee. Google is increasingly finding its way into seemingly every aspect of our lives, with the acquisition of “smart home”? appliance company Nest Labs and its Chromecast and Android TV softwares, its Android Auto platform for cars, and of course its Android Wear platform for smartwatches and other wearables. It even acquired Titan Aerospace, a developer of solar-powered drones, this April, with the intention of collecting images for Google Maps and possibly bringing Wi-Fi to remote locations. At its I/O conference, Google also announced the launch of Android L, its newest Android version, along with the Material Design language, a visually appealing, flat design that engages users through dimensionality and motion and is intended to bring a unified look to Google’s many products. Google’s mission is to increase the cohesiveness of its products and extend its reach, and it definitely seems to be achieving this. Not only does its main search advertising business seem to be thriving, driven by the growth of mobile search, its continuing expansion and innovation makes it a tech giant with a multitude of products that impact our daily lives in significant ways. There is little doubt that BIDU and GOOGL are both excellent companies. BIDU is sure to see continued rapid growth in the next few years, as both its business and its market have yet to mature. 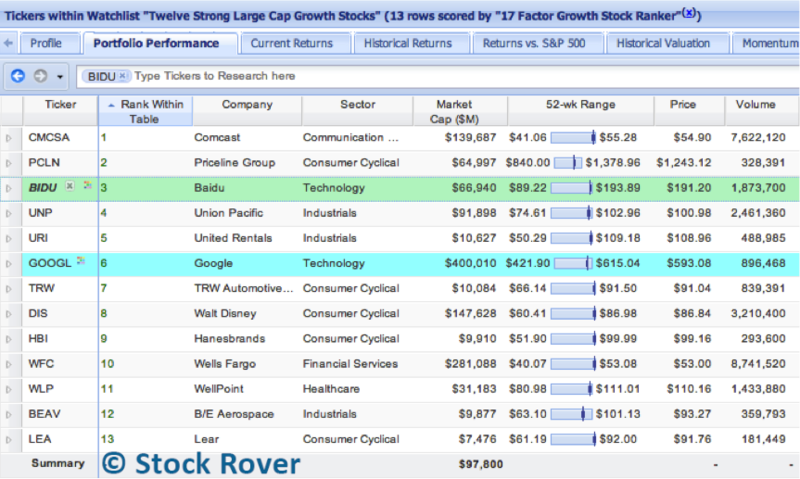 In fact, BIDU’s short-term returns are likely to outpace GOOGL’s. Even so, I would choose GOOGL over BIDU as a long-term investment. GOOGL has proven its ability to make consistent profits, even as its search business has matured, through its creative technological improvements and strategies for growth, plus its diverse array of products and penetration into international markets make it a safer choice as well. As both companies have been funneling money into growth initiatives lately, it will be interesting to see how their investments will pan out in the future. After all, their decisions have an impact not only on investors’ portfolios but also on the everyday life of a human in the 21st century.